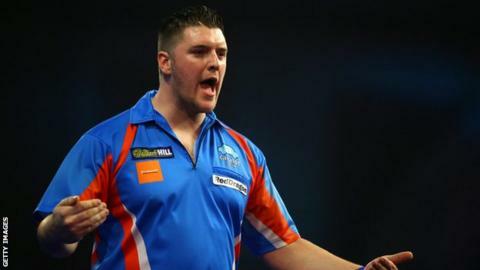 Northern Ireland's Daryl Gurney lost 4-1 to defending champion Gary Anderson in the second round of the PDC World Championship at Alexandra Palace. Gurney, 29, took the first set of a high quality match 3-2 in legs with an average of 100 but lost the second to the world number two by the same score. Gurney missed darts for the third set and lost it 3-2 and Anderson wrapped up the match by winning the last two sets. The Londonderry man has lost four times in the second round of the tournament. Gurney, ranked 36 in the world, beat Jamie Lewis 3-1 in the first round to set up the Boxing Day encounter with the Scot. The Northern Irishman had defeated Anderson 10-4 the last time the players met at the Players Championships Finals at Minehead in November. Brendan Dolan, from Kilcoo in Fermanagh, lost 3-0 to Australian Kyle Anderson in his first round match in London. Who will win the PDC world title? Read more on PDC World Darts Championship: Who will win in 2016?